After the first flush of spring bulbs has finished, there can be a lull before herbaceous perennials and annuals get going. This is when biennials come into their own, flowering from mid-to- late-spring and into midsummer. This group of plants is so often neglected, perhaps because we’re a little impatient: they germinate and produce foliage one year, then flower the next. Because spring is such a busy time in the garden, it’s easy to forget to sow them. 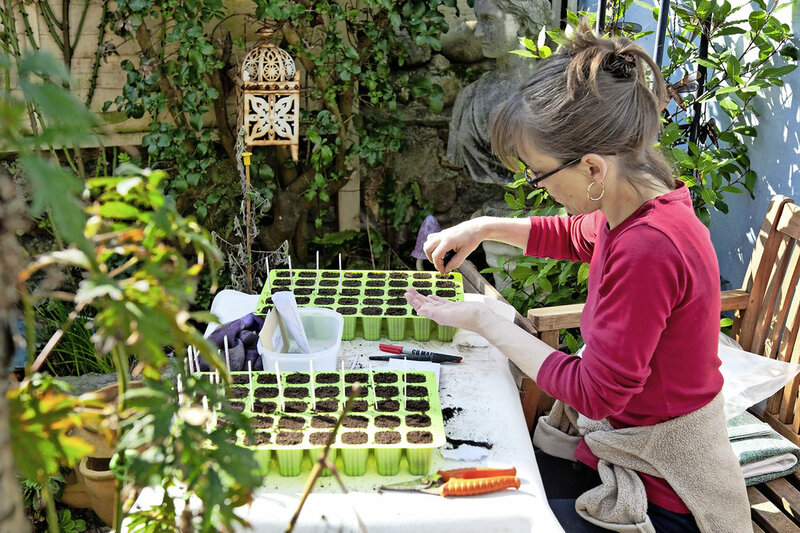 However, the fact they need sowing in late spring and summer is a great bonus because our windowsills and greenhouses will start to free up over the coming weeks, making space for another batch of seeds. Garden centres tend to have a limited range of biennials – such as shorter cultivars of wallflower and sweet Williams – but you can widen your choice by sowing your own. • Biennials to sow in May: honesty, foxgloves, forget-me-nots. 1. Fill trays with multipurpose compost and press down gently to create a firm surface on which to sow. Distribute seeds on the surface of the compost. Check the packet to see if seeds need light to germinate (leave them uncovered) or whether they require a fine sprinkling of compost or vermiculite on top. 2 Label and water by standing the trays in a couple of centimetres of water so the compost absorbs the water from below. Or, use a watering can with a fine rose attachment so the seeds aren’t displaced. 3 Place somewhere bright and warm but watch the compost doesn’t dry out and the seedlings don’t wilt or are scorched. Keep well-watered, then prick out when they have two sets of leaves. Grow on in individual pots and move to a cooler spot such as a cold frame or sheltered corner of a patio. The plants will be ready to plant out in early September. At its simplest, pruning is a means of manipulating a plant’s growth, shape and productivity. To prune plants well is not so much about knowing how anda where to cut, but knowing what you’re trying to achieve. The main reasons for pruning are to train a plant to grow in a particular way, to balance its growth, to control the production of flowers and fruit, to maintain its health and restrict its growth. A final type of pruning, remedial or renovation pruning, may be necessary with neglected or overgrown plants. • Formative pruning refers to the pruning required in the early years of a plant’s life. This allows you to create a plant that is well proportioned and attractive. Plants pruned correctly in their formative years are easier to care for in their later years. • Routine pruning is the act of maintaining the plant’s shape as it grows. A healthy plant shows vigorous active growth especially when it’s young and establishing itself. As plants mature and begin to flower and fruit on a regular basis, the production of shoots slows down: routine pruning can maintain more youthful vigour. In the case of willows and dogwoods, whose stems become more woody and dull as they age, colourful young growth can be achieved by hard pruning each year, cutting the whole plant down to within 5-8cm (2-3in) of ground level. • Remedial pruning is used to gain control of a plant that’s misshapen, congested or neglected. Dogwoods and willows both respond well to remedial pruning, but years of neglect can’t be rectified in one season. Dogwoods (cornus) and willows (salix) are among the easiest shrubs to grow; their stems, leaves and flowers provide year-round interest. Some willows also have attractive catkins while others are selected for their weeping habit or twisted stems. Lift clumps of snowdrops now to increase your collection and spread them to other parts of your garden. 1. DIG AROUND THEM Dig around clumps when they’ve finished flowering, but only do it if the ground isn’t frozen or waterlogged. 2. LIFT THEM CAREFULLY Gently lift the clump from the soil and tease it apart with your hands to make smaller sections. 3. REPLANT THE DIVISIONS Dig holes for the new clumps and fork over the base to release any compaction. Replant each smaller clump at the same depth they were at before. Firm in place and water. 1 Unscrew the secateurs Use a screwdriver to loosen the secateurs, then unscrew the cogs/bolt on the opposite side so they can be separated into their constituent parts. TIP: If they’re stuck, try turning them leftwards: ‘Righty tighty; lefty loosey’. 2 Lay the parts out in order Keep the parts in sequence, running left to right, showing how they fit back together to help you remember which bits go where. Try not to lose the spring which can roll away. 3 Sharpen the cutting blade Wipe any initial debris or sap off the cutting blade. Dampen the wetstone with a sprinkle of water and sweep the blade slowly and gently along the surface of the wetstone. 4 Wipe all parts with disinfectant Use a dilute disinfectant spray and a dry cloth or paper towel to wipe over the secateurs. To remove rust, use a scouring pad or wire wool. Give them a good rub, then wipe dry. 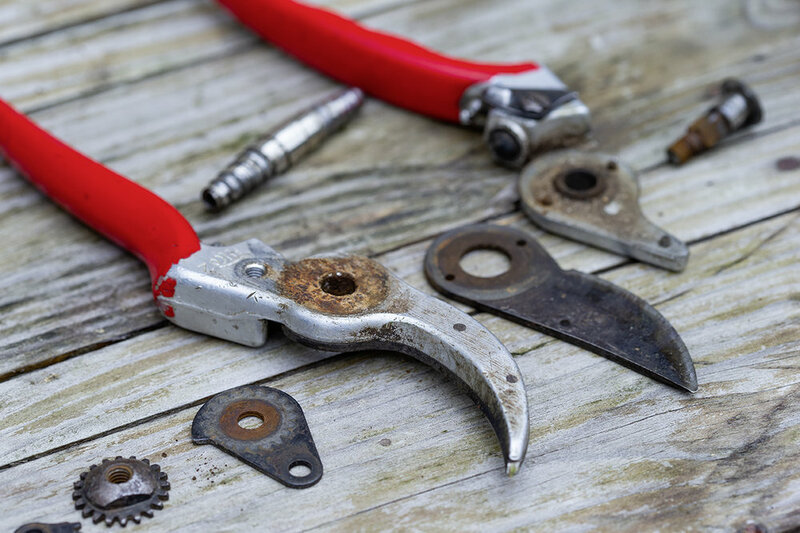 5 Oil the moving parts Reassemble the secateurs so you can give all the joints a final squirt of lubricating oil. This will ease the scissor action of the cutting blade, and coat the blade against rust. Now’s the time to make a festive wreath for the front door, so raid your garden for moss, berries and sprigs of evergreen foliage. Bring them indoors and wire them to a circular frame (either wicker or metal) available from florists’ shops and craft suppliers. Useful foliage includes smaller branches of any conifer (particularly blue ones for a modern look), holly, ivy, euonymus and box. Red holly, rose hips or cotoneaster berries will add a flash of traditional colour, but also consider orange pyracantha or purple callicarpa berries for variety. As a finishing touch, wire in pine cones, orange slices or baubles from the Christmas tree. 1. Snip off evergreen stems Find lush, attractive conifer stems, other colourful evergreens and berry-laden holly sprigs. Trim the conifer branches into 15cm (6in) pieces with secateurs. 2. Cover your wreath with moss Fix handfuls of moss to a circular wreath frame. Secure the moss with florists’ wire to create a moist cushion on which to secure the conifer and holly sprigs. 3. Hide the moss with conifer sprigs Wire on the conifer sprigs using florists’ wire, then decorate with small cones, holly berries, slices of dried orange and baubles from your Christmas box. 4. Hang the wreath Create a bow from ribbon and fix to the wreath. Attach the wreath to your door with wire or string. Mist the wreath with water to keep the foliage fresh. The winter months, when deciduous shrubs are dormant, present the perfect opportunity to rejuvenate old or congested specimens and give them a new lease of life. Hard pruning stimulates fresh new growth next season, but will come at the expense of flowers for a year or two. Leave evergreen pruning until spring. • Total rejuvenation Vigorous shrubs such as buddleia and cotinus can be rejuvenated in one go. 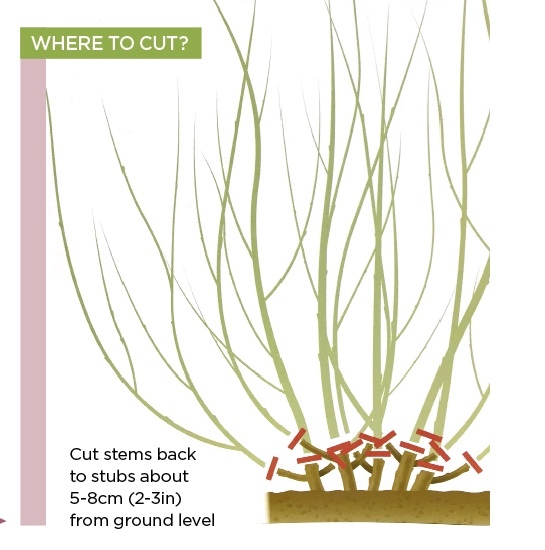 This means all the stems can be cut down to 10-20cm (4-8in) of the ground. They’ll sprout again in spring. • Staggered pruning Most shrubs benefit from a more staggered pruning carried out over three years to reduce the stress. In the first year, remove no more than a third of the branches. Start by cutting off dead, diseased and damaged stems back to ground level, and remove any that are crossing over other branches. These crossing stems can rub, opening up wounds where disease can enter. Cut back additional branches until a third of the plant has been pruned back. In the second year cut back or shorten another third of the branches, then the following year remove the remaining third so the whole plant is rejuvenated. l Feed plants afterwards With both the total rejuvenation and staggered pruning methods, give plants a general-purpose feed in spring and mulch with a generous layer of well-rotted compost to help them recover from the pruning and grow away healthily. 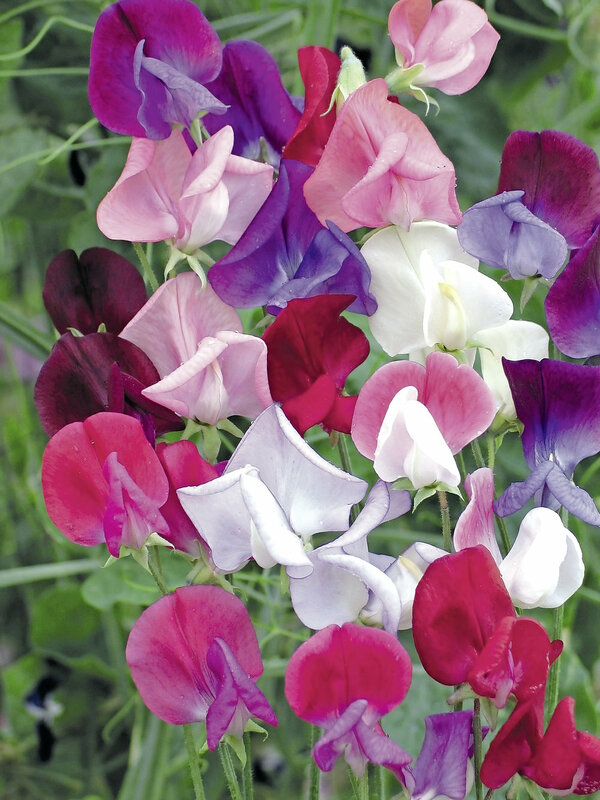 Get an early crop of these fragrant flowers next summer by sowing your sweet pea seeds now. The seedlings very quickly make long roots which can become congested in shallow seed trays or small pots, so use deep containers to sow them. Toilet roll tubes are a good option for sowing in spring, but the cardboard can get soggy and may become mouldy over winter. For a more robust option, look for deeper pots (such as the ones roses and clematis are grown in), which will give your sweet peas plenty of room to grow. Fill the pots with multipurpose compost. Sow 4-5 seeds per pot, equally spaced, and push them into the compost to a depth of about 1cm (½in). Cover with more compost. Water well and place in a greenhouse or cold frame to overwinter, watering whenever the compost becomes dry. High summer brings the pleasurable daily ritual of pampering your tomato plants. Ripe fruit needs to be picked and there’s careful watering to be done: sudden deluges lead to split fruit, while erratic watering leads to blossom end rot. Steady and just enough water is far better. • Feed pot-grown plants. Water the compost fortnightly with a high-potash liquid tomato feed. • Remove leaves that are directly shading fruit trusses. This will help green fruit to ripen. • Snap off side shoots from cordon types. These grow diagonally between leaf and stem; it’s easiest when plants are plump with water. Bush tomatoes don’t require pinching out but they sometimes need a few carefully placed sticks and string for support unless they’re one of the tumbling, hanging-basket cultivars. • Remove the tip of outdoor cordon plants. Make sure they’ve set four trusses of fruit, or up to seven trusses in the greenhouse. This encourages plants to focus their energy on ripening existing fruit. • Take off the lowest, yellowing leaves. This will encourage good airflow around plants, which reduces the risk of disease. • Watch for tomato blight If it strikes, salvage what you can – green tomatoes are good for chutney. Compost the plant in your green wheelie bin. Daily checks help you spot problems early; when you’re growing outdoors, choose blight-resistant cultivars. • Beat whitefly. Use yellow sticky traps or try introducing encarsia (microscopic, parasitic wasps) as a biological control. a tray ready in the centre of the table with garlic cloves, extra virgin olive oil and a bowl of prepared tomatoes. 1. Prepare the tomatoes first. Halve and squeeze out the pips, slice out any core then chop into 1cm (1/2in) pieces. Place in a bowl and add the torn-up basil leaves, a good drizzle of olive oil, a pinch of sea salt and freshly ground black pepper. Stir and set aside. 2. Toast the bread on a barbeque or griddle pan until nicely striped on both sides. 3. Rub the hot bruschetta with the garlic clove and drizzle over a little olive oil before spooning on the tomato mixture. If you like picking flowers from the garden or an allotment cutting patch to arrange in vases at home it’s worth employing a few tricks to make your blooms last as long as possible once picked. • Cut in the morning or evening when it’s cooler and plants aren’t under stress. This will help to prevent wilting. • Plunge the cut stems into a bucket of tepid water straight away. • Place the flowers in the water somewhere cool and shady for a few hours or overnight. • Cut stems at an angle so that more surface area is exposed to the water to maximise absorption. • Clean cuts are important. Don’t bash the stem as this damages the base of the stem and introduces debris into the water which causes bacteria to build up. • You don’t need to add bleach or anything else to the water, instead just refresh the water every few days. These flower lollies look almost too good to eat. All you need to make them is a lolly mould (from £3.99 at Lakeland Plastics), a scattering of edible flowers (such as nasturtiums, borage or violas), sugar syrup and water with an optional splash of food colouring. You could also use coconut water, lemonade or fruit cordial to make the frozen lolly. 1 Gently rinse the flowers before adding them to each mould. 2 Fill a third of the ice lolly moulds with the edible flowers. 3 Pour one part sugar syrup and two parts water in a jug. Add a splash of food colouring if you fancy. 6 Remove from freezer and place on a kitchen counter fopr five minutes to make the lollies easier to remove from their moulds, or run under a cold tap. 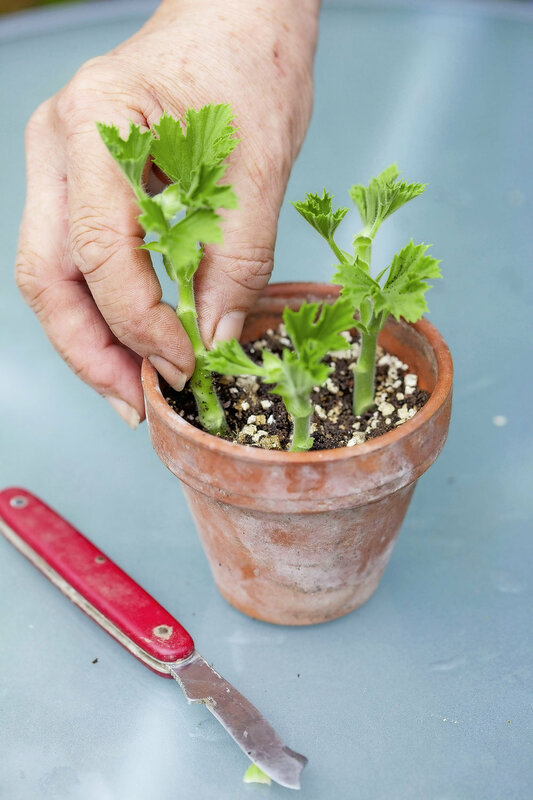 The fresh growth of many perennials and some shrubs will root very easily, which means softwood cuttings are one of the most reliable ways to propagate many plants. The best time to take these cuttings is between April and June. Suitable plants include lavender, pelargoniums, fuchsias and salvias. 1. Fill a module tray or 9cm pots with seed compost. 2. Remove the soft growing tips of non-flowering stems using a sharp, clean knife above a bud on the parent plant. Only take cuttings from a healthy plant. The cutting should be 7-10cm (3-4in) long. 3. If you’re taking lots of cuttings pop them in a plastic bag to stop them wilting while you prepare and plant up the other cuttings. 4. Trim the cutting to below a leaf and strip off the lower leaves. 5. It’s not essential but you can dip the base of the cutting in hormone rooting powder, which can speed up the formation of roots. 6. Make a hole in the compost with a dibber or plant label and insert the cutting into the hole. Firm in place, water and label. Softwood cuttings will dry out quickly but they can also be prone to damping off so getting the right balance is crucial. Place in a heated propagator or cover the pots with a clear plastic bag to retain moisture around the leaves. Ventilate daily, either opening vents on the propagator or removing the plastic bag and getting rid of the excess moisture. Place somewhere bright but out of direct sunshine. Keep the cuttings moist and they should root in 2-3 weeks. A good indication they’ve rooted are signs of new growth, although this isn’t always foolproof, so it’s also worth checking the drainage holes of the pots for signs of roots. Pot on into individual pots. 1. Cut back colourful winter stems Plants grown for their colourful winter stems such as dogwoods, willows and ornamental rubus (bramble) need to be hard-pruned in early spring. As stems mature they tend to lose their vibrancy, so pruning is necessary to maintain winter colour and prevent shrubs becoming congested. Plants should be 2-3 years old before you hard-prune them. Cut back to 5-7.5cm (2-3in) above ground. Rubus stems can be cut right down to the ground. 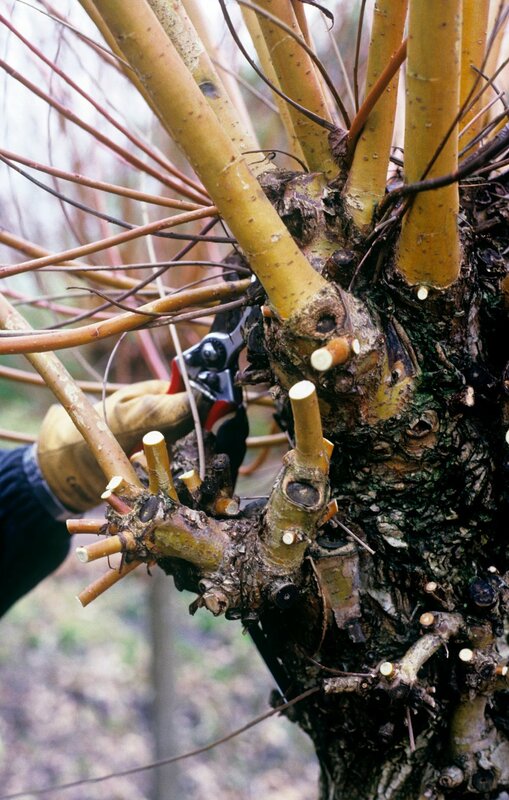 Vigorous plants such as willow can be cut back every spring, those with more moderate growth, such as cornus ‘Midwinter Fire’, need only be pruned every few years. 2. Revive your lawn After a mild winter, your lawn will already need a quick mow and tidy up. For the first mow of the year, give it a light trim, setting the mower at its highest setting. Scatter grass seed on any bare patches and rake it in. Cover with net to keep off any birds until the seeds have germinated. Water every couple of days during dry spells. It should take a couple of weeks for the seed to germinate. Towards the end of the month, apply a spring lawn fertiliser or, for an organic alternative, chicken manure pellets to the surface of the grass and rake in. 3.Care for spring bulbs To ensure fabulous displays of spring bulbs every year, it’s worth giving them some care and attention over the coming weeks. • Remove fading flowers. Either snap off the flower head with your fingers or snip off with secateurs. This will stop the plant sending energy into producing seeds and will encourage more floriferous bulbs next year. Wear gloves when touching daffodils and hyacinths as both can cause skin irritation. • Leave the foliage and stems in place, however tempting it may be to cut them back or tie them up. Allow them to die back naturally for at least six weeks as the energy in the leaves will go back into the bulb. • Feed with a general purpose fertiliser such as Vitax Q4 (£7.99 for 2.5kg). For bulbs grown in pots use a liquid tomato feed for 4-6 weeks after flowering. 1. Fill seed trays with a seed compost or a 50:50 mix of multipurpose compost and Perlite to just below the rim of the tray. Firm down so there are no air pockets. 2. Sow the seeds thinly onto the surface of the compost. Some seeds will need a light covering of compost to exclude light, whereas tiny seeds such as Iceland poppies need light to germinate and are best left uncovered. Check the packet instructions. 3. Water gently using a watering can with a fine rose attachment, or place the trays in a sink with some water in the bottom for about five minutes or so, and allow the moisture to be absorbed from below. You’ll know the compost is moist enough when the surface starts to glisten. Remove the trays from the sink and allow to drain. 4. Cover with propagator lids or pop the trays inside a clear plastic bag. This will help to retain moisture while the seeds germinate. Remove as soon as you see signs of life. 5. Place trays on a warm, bright windowsill or inside a heated propagator. If you had a real tree for Christmas, now’s the time to recycle it. Most councils will take away trees for shredding in the weeks after Christmas. Check with your local refuse department to see what their policy is regarding collection. If they don’t recycle trees and you can’t take it to your local recycling centre, another option is to repurpose the tree yourself. 1. Remove any branches that still have lots of needles on them. Cut these up into small pieces or use a shredder if you have one. Pop them into a black bin liner or old dustbin and leave them to rot down in a shady, damp corner as you would with leafmould. They’ll take a while to decompose – six months to a year - but will eventually make a lovely acidic mulch for ericaceous plants. 2. Any large branches can be cut down into smaller sections and used to make a bug hotel or gathered together in a shady corner or by a pond to create a wildlife habitat. 3. The branchless trunk could be reused as a fence post or sawn into sections and used to edge a path. This works particularly well under trees to create a woodland look. In order to get the sweet, tender stems of pink rhubarb you’ll need to force them. This simply means excluding the light from the plant. You can buy special forcing jars to do the job, but a plastic compost bin you’re not using or a large dustbin work just as well and give large clumps plenty of space to shoot away. Place on top of the rhubarb crown when you start to see signs of life this month. In windy areas it’s worth weighing down plastic forcers with stones or bricks to keep them in place. Clean, sharp tools last longer and work more effectively, but it can be tricky to keep them in tip-top condition when they’re being used every day. So take the opportunity during the quieter months to give your tools an annual service. 1. Brush off dried soil with a stiff brush, then wipe handles and metal with a damp cloth to give them a thorough clean. Remove any rust with wire wool. Allow to dry thoroughly. 2. Sharpen the cutting edge of hoes, spades and lawn edging tools with a flat engineer’s file. Carefully wipe sharpened metal blades with either vegetable oil or WD-40. 3. Take apart secateurs and sharpen using a whet stone lubricated with oil. If the blades can’t be removed use a sharpening stone designed for pen knives. 4. Wipe wooden spade shafts and handles with a cloth soaked in linseed oil. This will make the wood look less dry. Gardeners with a penchant for tender plants have been reasonably lucky for the last few years. A succession of mild winters with little if any snow have meant that most tender plants have sailed through the cold season unscathed. Yet there’s always the risk that frost can bite when you least expect it. Growing at altitude in the wild, hardy alpine plants can shrug off frost and use a blanket of snow for insulation. Their real enemy in winter is heavy rain and boggy soil, which can make them rot. To keep them alive, protect them from rain by ensuring they’re planted in a well drained gritty soil and build them a small perspex shelter supported on columns of bricks, or use a plastic cloche with open ends so they can stay ventillated without getting their crowns wet. Plants such as dahlias, eucomis, begonias and gladioli have tender bulbs, tubers and corms that benefit from a deep mulch of compost topped with a layer of chipped bark in winter. In colder parts of the country it’s better to lift them before the frosts, shaking off any soil, cutting off the stems to 10cm (4in) and leaving them to dry for a couple of weeks. Then, store them in a frost-free place in a suitable plastic tray filled with compost. Tender plants, rooted cuttings and young autumn crops can all be protected from frost, wind and hail by swaddling them with horticultural-grade fleece. This light weight and porous fabric allows the plants to receive the light, warmth and moisture they need to grow, but without making plants overheat or increasing humidity. Hold it in place using heavy stones or bricks, without dragging the plant down. Make a tent over taller plants using garden canes and pegs or clips. Tender exotic plants such as banana plants and tree ferns will die if exposed to freezing temperatures, so if you can’t pot them up and move them into a frost-free greenhouse or conservatory, it’s best to wrap them in a layer of fleece or hessian, with straw or polystyrene packed inside to protect their crowns. It’s best to get this protective layer in place by late autumn. During long period of warm weather the ‘duvet’ should be removed to prevent the plant from sweating and possibly rotting. Plants in containers are specially vulnerable to frost damage as their roots don’t enjoy as much insulation as they would if planted in the ground. Wrap the pots in a duvet of bubblewrap and hide it with a layer of hessian and twine for a more aesthetically pleasing look on the patio. Don’t forget that terracotta pots are porous, so ensure they stay well drained by setting them on pot feet. Adding a thick 10cm (4in) mulch around the bottom of a shrub, or over the top of a dormant perennial plant underground, can insulate the soil and keep its roots, tubers, bulbs or corms from freezing. Useful organic mulches (which will rot down in time, adding nutrients to the soil) include bark, garden shreddings, compost, well-rotted manure, grass clippings, newspaper, leafmould and straw. 1. Spruce up borders - There can be a strong urge to cut back garden borders at this time of year, but resist being too tidy. Leave anything that has attractive seed heads, seasonal colour or berries as these will create interesting silhouettes in the low autumnal light, catch the frost and provide food and shelter for wildlife. 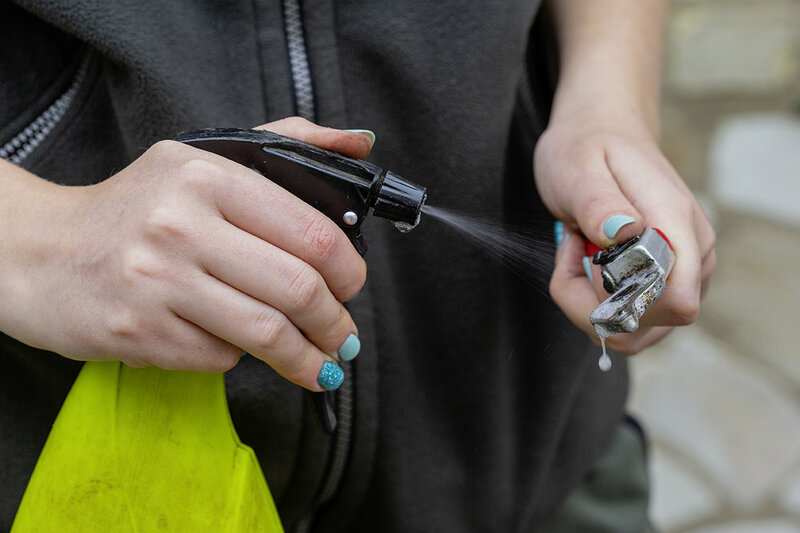 Instead take your secateurs to soggy foliage flopping onto paths, as this can become a slip hazard, and anything that is dying an unattractive death. 2. Order bareroot roses - Planting bareroot roses is more cost effective than buying them as container-grown plants; they also tend to establish more quickly. Bareroot roses are only available from November to March as the plants need to be dormant when they’re despatched by the nursery. The best time for planting is late autumn before the ground is frosted or waterlogged, so order now to ensure delivery in time. 3. Make leaf mould - Decayed leaves are generally low in nutrients but they’re fantastic for adding organic matter, which improves the structure and water-retaining properties of soil. Leaves tend to break down more slowly than other vegetation, so it’s best to compost them separately. Either rake or gather up the leaves and store them in plastic rubbish bins with holes drilled in the base and sides to allow for drainage and air flow or fill black bin liners and use a garden fork to make some holes, or make a cage for them using wooden stakes surrounded by chicken wire. 4. Lift or mulch dahlias - Lifting and storing dahlias over winter is the best way to ensure they’ll survive. Wait until the first frosts have blackened the foliage, then cut the stems down to the ground. Carefully lift the root ball and remove as much soil as possible from around the tubers. Store the tubers upside down somewhere dark, dry and frost-free for a couple of weeks to allow any moisture to drain away. Brush away any remaining soil, wrap in newspaper and pop them in crates or trays over winter in a well-ventilated, frost-free place to prevent rotting. 5. Take hardwood cuttings - Hardwood cuttings are an easy way to propagate a whole host of woody climbers, trees and shrubs. Choose long, healthy, vigorous shoots from this year’s growth, about the thickness of a pencil. Use secateurs to remove the shoots above a bud. Remove the soft tip then, cut into sections about 20cm (8in) long. Cut above a bud with a sloping cut. This will allow water to drain away and also indicate the top of cutting. For the bottom of the cutting cut just below a bud with a straight cut. Put them in a well-drained compost. Fill deep containers with a free-draining compost mix – 50:50 compost and horticultural grit. Push the cuttings in around the edge leaving one-third above the surface of the compost. After watering, place them in a cold frame, cold greenhouse or a sheltered spot. Leave them in their pots until the following autumn, making sure they don’t dry out in the meantime. Once they’ve rooted, pot on into individual containers. 1. Clean out the greenhouse - By the middle of the month any crops in the greenhouse will be unlikely to ripen any further. Pick what you can then take this opportunity to clean out the greenhouse. Wipe the glass to remove any dust and dirt to maximise any light entering over the coming months. Wash the internal framework and staging, and sweep the floor of any debris to get rid of any pests and diseases. This will give you a pristine greenhouse that will be the perfect home fortender or borderline hardy plants over winter. 2. Plant spring bulbs - No garden should be without the burst of cheerful spring colour that bulbs provide. Daffodils are the classic spring bulb, but there are so many more to choose from, whether it’s muscari, scilla, ipheion, chionodoxa, leucojums or a whole range of fabulous fritillaries. And now is the perfect time to plant them. Pop them in the ground, or in pots, three times the depth of the bulb with the pointy end upwards. 3. Naturalise bulbs in grass - For a naturalistic way to grow bulbs in the garden, plant them into grass. This needs to be an area of grass that can be left to grow in late spring and early summer until all the foliage from the bulbs has died down, rather than a patch of pristine lawn. Bulbs that are ideal for naturalising include our native daffodil Narcissus pseudonarcissus, snake’s head fritillaries and crocus. Either use a trowel or abulb planter to remove a section of grass and soil, drop in the bulb, then fill the hole back up with the soil and replace the grass. 4. Look after your lawn - Now's the perfect time to get your lawn back into shape after summer. Rake out the thatch – dead grass and moss - that will have built up. Use a fork to aerate the lawn, apply a top dressing of sand to improve drainage and brush this into the holes you’ve made with the fork. Scatter a lawn fertiliser, but make sure you use an autumn fertiliser that is low in nitrogen as you don’t want to encourage lots of lush growth at this time of year. 5. Divide early-summer flowering perennials - It might be getting chilly on a morning but because soil holds on to warmth longer than air now is a great time to divide some perennials. At this time of year it’s best to divide just spring and early summer-flowering perennials that need rejuvenating, such as hardy geraniums and Alchemilla mollis. Generally these plants need dividing every 3 or 4 years. Later-flowering perennials like rudbeckia and heleniums and most grasses don’t like their roots to be disturbed at this time of year. If they need dividing they should be left until next spring.